Plate three from the second set of Thomas and William Daniell's 'Oriental Scenery'. 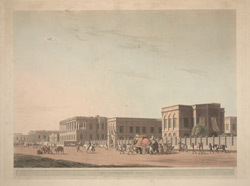 By the end of the 18th century, Calcutta had become a flourishing city with many neo-classical public buildings flanking the north side of the Esplanade. The Council House was erected in 1764, and served originally both for the meetings of the Company's Council, which ran the affairs of Bengal, and also as the Governor's residence.